alaTest hat 22 Testberichte und Kundenbewertungen für Hisense 55K760 Series zusammengefasst und analysiert. Im Durchschnitt wurde das Produkt mit 4.2/5 bewertet, verglichen mit einer durchschnittlichen Bewertung von 4.3/5 für andere Produkte. Der Klang und die Größe wird von vielen Testern gelobt. Die Bildqualität wird ebenfalls positiv gesehen. Wir haben sowohl Nutzer- als auch Expertenbewertungen, Produktalter und weitere Faktoren ausgewertet. 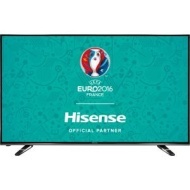 Im Vergleich zu anderen Produkte erzielt Hisense 55K760 Series einen alaScore™ von 93/100 = Ausgezeichnet. Only had this a week but so pleased with how good the picture is! Many TVs look shady & blurred, but to be honest it was better than I expected! I've had this Hisense for over two weeks now, I'm very happy with it. I think the picture quality is very good and the sound isn't bad either but that won't stop me wanting to buy a soundbar to go along with the great images. Bought two TVs for a church one of which stopped working after being used for only two hours once. For the price, £399, its difficult to fault. 4k resolution, small bezels, nicely thin and easy to hang on the wall. Only issue I have had is the sound occasionally dropping. Otherwise a perfect daily driver family TV. Excellent value for money @ £399. I believe the same television from Argos is £78 dearer and they only give a two year guarantee --- Richer Sounds extend the guarantee to six years at no extra cost.